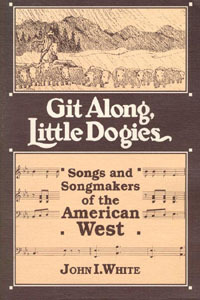 The long-forgotten western diaries of Owen Wister, author of The Virginian, contribute an interesting bit to the history of one of the best-known American cowboy songs-one usually titled "Whoopee Ti Yi Yo, Git Along, Little Dogies"-and indicate that more than three-quarters of a century ago Texas cowpunchers were familiar with this lyrical description of life on the cattle trail. John I. White sang cowboy songs on New York radio stations and recorded for the American Record Corporation while he held a full-time position with a major map publishing firm. In 1965, he retired from business and began writing articles about Americana; these have appeared in a number of periodicals including, The American West, American Heritage, Yankee, and American History Illustrated.